Hik-ka-ma and apples were made for each other. Sometimes I think I have so many recipes I couldn’t possibly have room to add one more to my collection and then along comes a crisp, fresh salad that has so much crunch and flavors I could not resist asking for the recipe along with everyone else at our bunco get together a few weeks ago. I would almost call this a slaw because there is no lettuce involved and the fact that things are all cut into thin julienned pieces it kind of looks like a slaw. Salad/slaw, whatever you call it it’s wonderful. Our bunco group is going into it’s fourth year and we always share lots of food, wine and laughs for the night. One of our new members, Susan, brought this salad and it was a huge hit with everyone. This would be a great salad with just about anything; it could be served alone, along with some grilled meat/poultry/fish, or with brunch dishes. Like I said, it would be good with anything. I made this for grandson, Milo’s 5th birthday party (brunch) a few weekends ago. Last year for his brother’s first birthday party, his dad did a pig roast (baby piglet) and I’m thinking how many one year olds have a pig roast for their first birthday. Well, he did and it was so much fun. Even the older kids loved looking at the pig roasting away while I’m thinking — “that poor little thing”. But in the end, it was delicious. So for Milo’s birthday, it was brunch and we had quiche, this jicama apple salad, Coconut Banana Puffs and of course sausage balls. I’ve used jicama for years although I have to admit before moving to Texas I don’t think I had ever heard of it yet alone knew how it was pronounced (HEE-ka-ma or HIK-ka-ma). It’s hard to peel a jicama and is best if you cut top and bottom of jicama and then start with your knife and cut off the sides until you have all the skin removed. Jicama is low in carbs, calories and fat and when you add in the apple, peanuts, onions, how much healthier could you get. 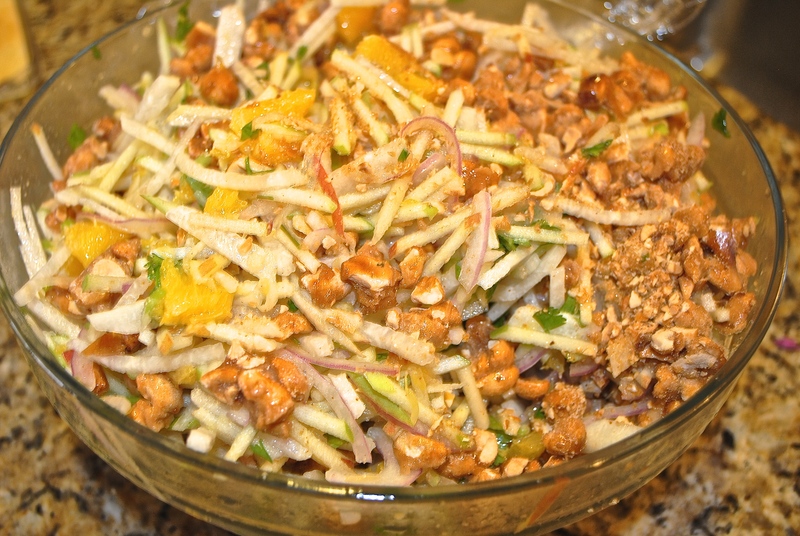 So if you are adventurous enough to try this salad, please leave a “comment” in the section below (it’s easy) because I love hearing what others think of the recipes I post. And, thank you Susan for this recipe and I did not change one thing. I doubled the recipe and used two jicama. If you make this, just use one recipe and not double. I had tons left over from the 14 that ate the salad. Cook the peanuts with the sugar and water. 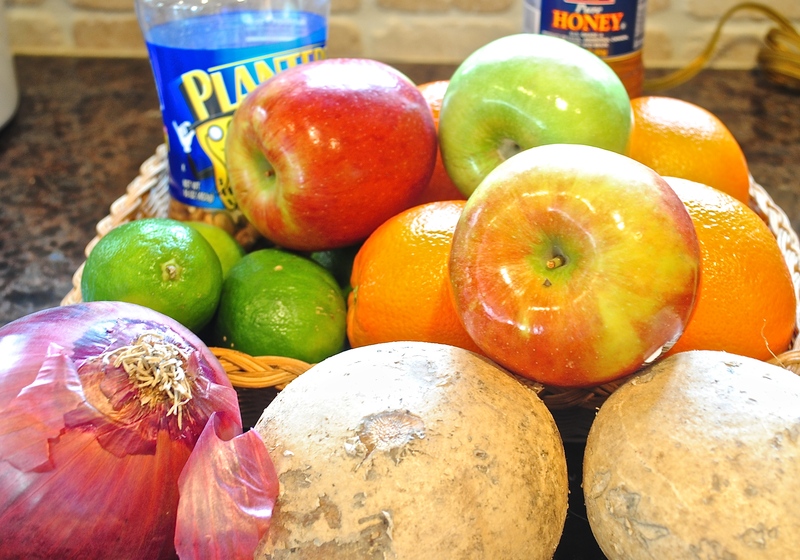 Julienne the jicama, apple and add to bowl with oranges. After you add the onions and cilantro, toss with the dressing until well coated. Top with candied pecans and serve. 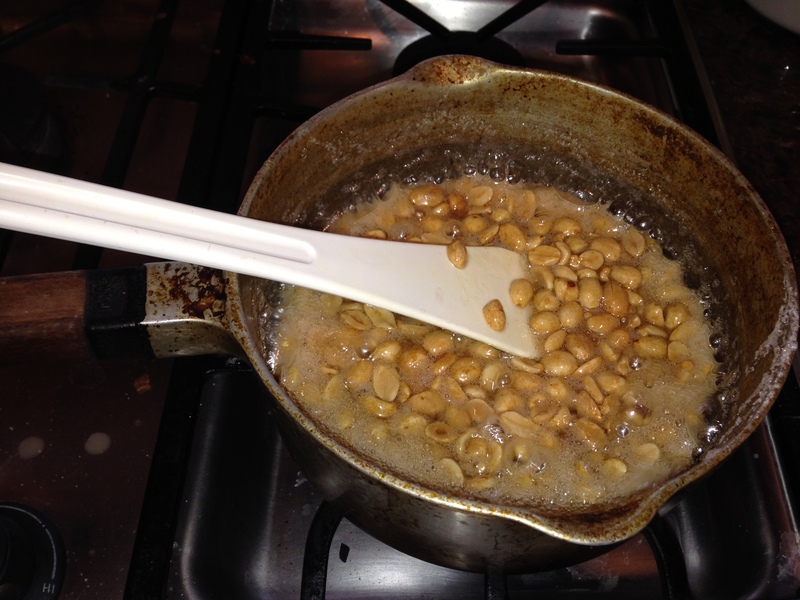 For the candied peanuts: Combine the sugar and water in a sauté pan over medium heat. Cook, stirring continuously, until the sugar has completely dissolved. Add the peanuts and continue stirring until the sugar turns golden brown, about 8 to 10 minutes* ( be careful not to over-cook the nuts, or the sugar will burn)*. Immediately remove the candied nuts from the pan, and spread out on parchment paper or silicone-lined baking mat to cool. When cool, gently break up the clusters. 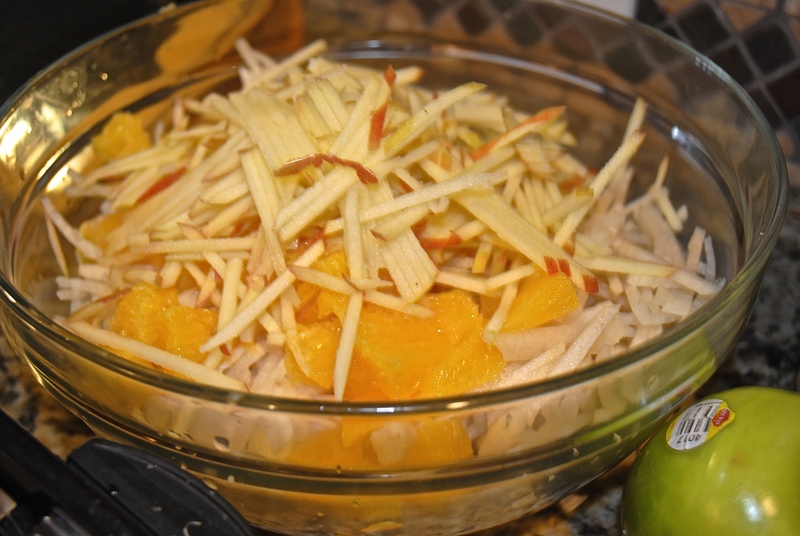 For the salad: In a small mixing bowl, whisk together the orange juice, lime juice, vinegar, honey, oil and cayenne. Season with salt to taste and set aside until needed. 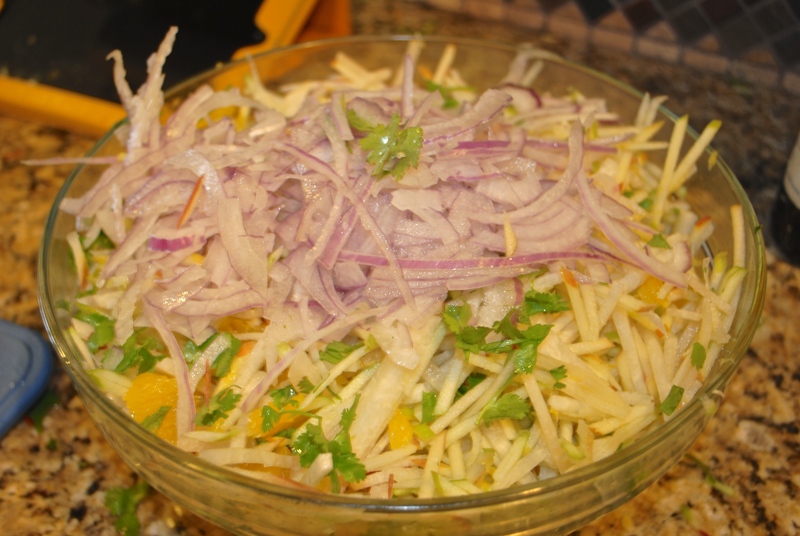 Cut the jicama and apple into 1/8″ wide julienne strips. (Can use a mandolin to slice and then cut into thin julienne strips — my mandolin has a julienne setting). 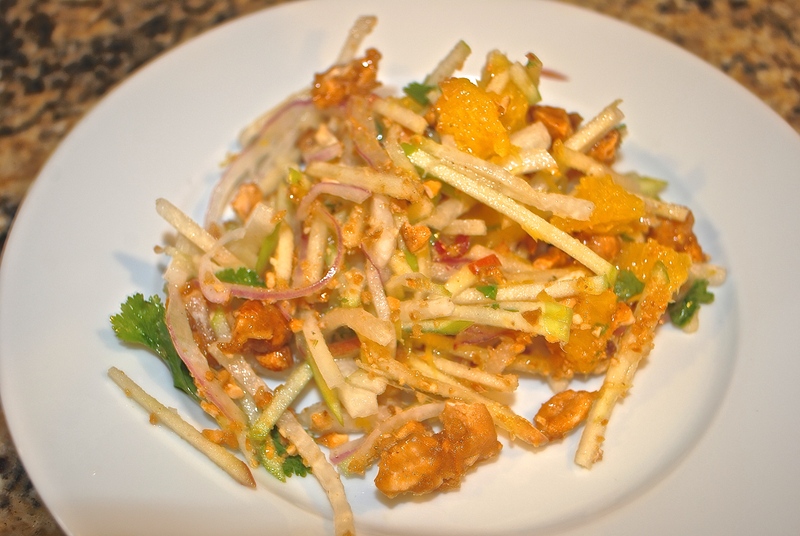 Combine the jicama, apple, onion, oranges (or tangerines) and cilantro in a mixing bowl. Toss with the dressing to thoroughly coat. (toss several times before serving. Refrigerate at least 30 minutes. Top with candied peanuts before serving. *When I did my candied peanuts, the sugar turned crystallized pretty early. If you lower the temperature and keep stirring the sugar will melt again and coat the peanuts. I like doing it this way because it won’t have a really gritty/sugary texture. Just make sure to remove them from the pan before they scorch. Also when using the mandolin on the apple with the julienne setting, it worked fine but I found doing the jicama a little harder with that setting so I cut it into thin slices using the mandolin and then hand cut the julienne pieces using a knife.